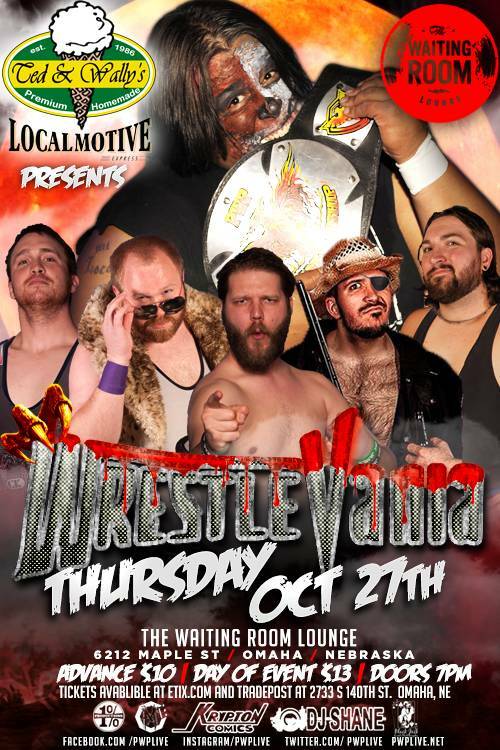 Ted and Wally’s Premium Ice Cream presents: PWP WrestleVania!! – Thursday October 27th at The Waiting Room Lounge in Omaha, NE!! *** PWP Champion BRANDEN JUAREZ defends his title against “DELICIOUS” DEVIN CARTER. Carter & Pat Powers are coming off of a loss to Zac James & Al Snow on October 1st, however Carter still came to PWP management demanding a PWP title shot. When consulting with Juarez regarding Carter’s request, Juarez accepting the challenge without hesitation. And so the match is official. Will Juarez retain his championship? Or will Carter capture the highest prize in PWP? And what role will Pat Powers play? Pat seems to actually believe that he is leading the US Presidential polls, and when asked what exactly he had in mind for this match, Pat said it was simple – a contract for a guaranteed shot at the PWP Championship, hung from a pole, the first man to capture the contract, wins. And so, the match has been made official, be there to see who grabs the contract! These two former friends and tag team partners collided earlier this month. Dalton got himself disqualified when he refused to break on the referee’s count, Dalton then continued to beat on Purple after the match was over. Purple is definitely not done with Roth, and looks for revenge at WrestleVania! Tickets just $10 in advance, $13 day of. On sale NOW online at www.etix.com/ticket/p/5307811/pwp-live-presentswrestlevania-omaha-the-waiting-room – or at CD Tradepost at 140th & Center (right behind Red Lobster), or at the door the night of, while they last. Doors open at 7:00 PM, action kicks off at 8!! This entry was posted on October 23, 2016 at 7:43 pm	and is filed under Uncategorized. You can follow any responses to this entry through the RSS 2.0 feed. You can leave a response, or trackback from your own site.